Our accredited course equips you with the ability to manage complex construction projects from design to completion, increasing your knowledge in construction management, project planning and design of structures. You will also develop your understanding of the core principles of civil engineering, including structures, materials, geotechnics and hydraulics. Through fieldwork, site visits and design projects you will put theory into practice and work alongside students studying related subjects or courses, such as construction management and architectural technology. This multidisciplinary approach to project work, designed in consultation with our Industrial Advisory Board, mirrors what you will experience in industry. You will have access to specialist facilities including a concrete lab, hydraulics lab, soils lab, geotechnical centrifuge, dynamics lab and computer suite. The option of a salaried placement year provides valuable work experience and you will have the opportunity to learn Building Information Modelling (BIM) to further enhance your CV. There is also the opportunity to study abroad in your third year. If you achieve the required standard in year 2, you can choose to progress directly to the third year of the Civil Engineering with Construction Management MEng and study towards a masters-level qualification. The first year will introduce the key elements of the course and give you an appreciation for the industry, as well as a broad yet thorough introduction to various aspects of the discipline. Modules become more tailored from year 2. In your final year you will have the freedom to choose your own option modules and research project. You will learn through tutorials, group practicals, design weeks, laboratory work and multi-disciplinary projects. You'll also take part in field courses ranging from geological studies to surveying and have the option of a placement year. After year 1 you may also transfer to our Civil Engineering BEng(Hons) or our Civil with Environmental Engineering BEng(Hons). In your first year, you will explore the fundamental elements of civil engineering in relation to business, society and the sustainability of the built and natural environment. You will also learn laboratory and IT skills, together with transferable skills in teamwork, problem-solving and oral, graphical and written communication. You will also undertake a group project linked to the Engineering for People Design Challenge. This module will introduce you to the equipment and methods used in both land and construction engineering surveying. The module will provide you with a thorough grounding in both the theoretical and practical aspects of surveying and covers a range of surveying topics from basic measurement of heights, distances and angles, to setting out coordinate positions on site. As a result of the nature of the content, there is a focus on practical skills with much of the delivery taking place in a practical setting. This module will introduce you to the analysis of simple structures. Through the application of the equilibrium equations, you will be able to determine the support reactions and internal forces in structural members. The study will be undertaken through rigorous analytical and graphical approach as well as through physical conceptual understanding of the structural behaviour. The calculation of displacements and stresses will be also introduced as base of the limit state principles. This module covers basic material science relating to construction materials such as timber, steel, concrete, masonry, polymers, bituminous materials, etc. You will develop an understanding of commonly used construction materials and evaluate the performance of different materials and to identify a variety of failure types. You will have the opportunity to test some of the main properties of basic construction materials, through laboratory sessions. This is an introductory module covering principles of soil mechanics and engineering geology. The syllabus includes identification of soils and common rock types; engineering description and classification of soils and rocks; physical properties of soils and rocks; stresses in soils; earth’s surface processes; an introduction to geological maps. Lab classes, tutorials and a field day will give you hands-on experience. This module will introduce you to the mathematics and statistics required to study civil engineering. Vectors, linear algebra, matrix analysis, solutions of a set of linear equations, functions of one or more variables, differentiation and integration will be covered. Statistical tools are provided for estimating uncertainty in civil and environmental engineering problems. This module will introduce you to the range of issues related to the content and role of the civil engineering profession. Through independent and self-managed research, critical evaluation of published studies and writing of technical reports, you will develop an appreciation of the health and safety, environmental and sustainability issues related to civil engineering projects. It is linked to Engineering for People design Challenge UK and aims to prepare you for an effective professional life by encouraging best practices in cooperation and teamwork. In your second year you will build on the knowledge and skills you have acquired in your first year. You also apply what you have learned to civil engineering design and construction tasks. A placement year offers an excellent opportunity to gain work experience, build a professional network, increase your confidence, develop existing skills and discover new ones. The experience also significantly enhances your CV. Our students have been on placement in organisations including Mackley, Balfour Beatty, Transport for London and South East Water. There is also the opportunity to study abroad. In your final year, you will embark on an individual project and choose from our option modules. This gives you the flexibility to explore areas including sustainable construction, waste management and design of renewable technologies, specialising in areas that interest you most. At Brighton, you will have the opportunity to learn Building Information Modelling (BIM). The industry standard BIM application is widely used in the UK construction industry to manage and deliver building construction projects from concept to completion. Gaining skills and experience in BIM, as part of your studies, can help to give you a professional advantage when you graduate. You will begin to develop your knowledge and skills in BIM by gaining a comprehensive understanding of modelling a building in a 3D environment, applying contractual requirements and learning about the building lifecycle. You will then have the opportunity to further investigate BIM's capabilities. The UK government currently states that all publicly-funded projects must now meet the BIM protocol, which has resulted in a push for a fast adoption of BIM in the industry, meaning there will be a growing demand for professionals who have BIM experience. You will gain practical skills right from the word go. With access to our wide range of specialist labs and equipment, you will be supported by highly skilled and knowledgeable technicians throughout your course, from group project work in your first year through to your individual project. We have a concrete lab, dynamics lab, heavy structure labs, hydraulics lab, soils and wave tank room, all housing specialist facilities and equipment that replicate industry. Click to view a virtual tour of our civil engineering lab facilities. 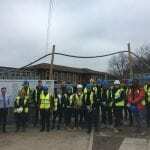 As part of their Construction Project Management module coursework, BSc Construction Management, Project Management for Construction and Civil Engineering with Construction Management second year students visited the Willingdon School project which is the basis of their coursework this year. 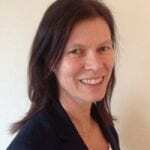 We interviewed Tracey Williamson, who graduated in BEng (Hons) Environmental Civil Engineering with Environmental Engineering Technology at University of Brighton in 1996. On November the 5th this year, instead of preparing for bonfire celebrations three Civil Engineering students undertook their first visit to the Knepp Castle Estate, where their final year dissertation projects are going to be based. 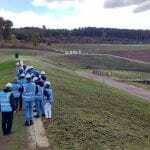 A visit to the site of Clay’s Lake flood prevention scheme in West Sussex provided a group of civil engineering students with a valuable glimpse of ‘what collaborative engineering work looks like’. We work closely with industry to ensure that the course has a focus on employability. Through our industrial liaison panel, visiting lecturers, site visits, collaborating on case studies and supporting mock interviews with industry partners, it helps give you a competitive edge and prepare you for employment. Our graduates are now working in organisations including the Environment Agency, Halcrow, HR Wallingford, WS Atkins, Mott Macdonald, Ove Arup, Hemsley Orrell Partnership, and Southern Water. Others choose to go on to postgraduate study. This degree is accredited as fully satisfying the educational base for an incorporated engineer (IEng), and as partially satisfying the educational base for a chartered engineer (CEng). A programme of accredited further learning is required to complete the educational base for CEng. Entry requirements are in the range of A-level BBB–BCC (120–104 UCAS Tariff points), or BTEC Extended Diploma DDM–MMM. You will be considered if your predicted grades fall above or within this range. A-level maths, or its equivalent, is normally a requirement for entry. BTEC should include at least an M in further maths. 30 points, with three subjects at Higher level including maths at grade 5. Pass with 60 credits overall in engineering or science diploma. At least 45 credits at level 3, with 24 credits at merit or above with overall distinction profile. Must achieve maths level 3 units at distinction. International foundation may be considered. Applicants with an HND may be considered for year 2 entry. You may also be interested in our construction and civil engineering blog.